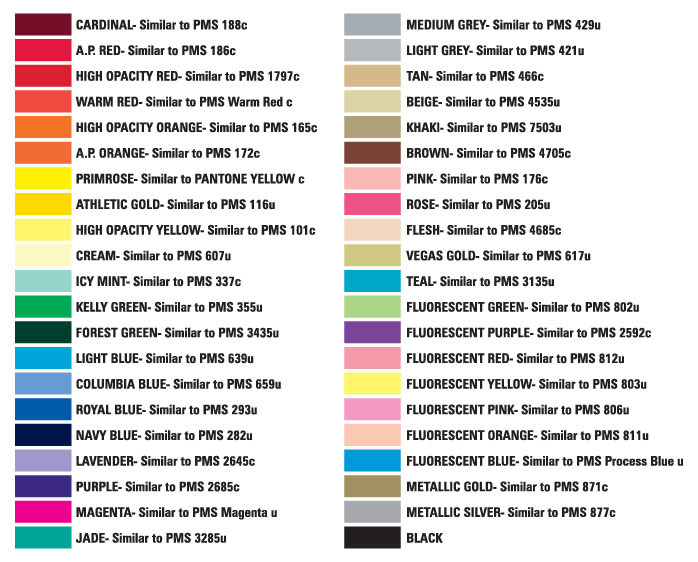 This chart shows our standard ink colors for screening shirts. Please note: Since silkscreen ink has a surface character which can't be seen on a computer monitor, these swatches are for a general reference only. 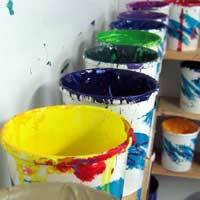 If you have any concerns about color accuracy, you should come into our office and view swatches of the actual ink. Also, these colors may not be accurate on computer monitors or when printed on paper. Computer monitors are notoriously bad at showing accurate color. (see, for example, fluorescent red and fluorescent pink, which in reality are intensely bright colors but appear dull here) Please refer to a PMS formula guide swatch book for a more accurate representations of these colors.